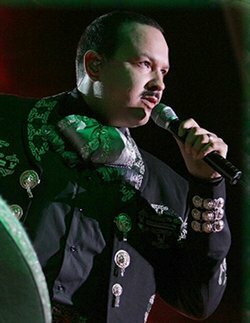 José Antonio Aguilar Jiménez (born August 7, 1968), better known as Pepe Aguilar, is a Mexican-American singer-songwriter and actor.Aguilar is the son of Mexican singer-actors Antonio Aguilar and Flor Silvestre. Two of his children are also singers, Leonardo Aguilar and Ángela Aguilar. Aguilar played his first concert at the age of three, joining his father Antonio Aguilar onstage at Madison Square Garden in New York City.Aguilar has sold over 12 million albums worldwide. His work has earned him four Grammy Awards, five Latin Grammy Awards, nineteen Lo Nuestro Awards, and a star on the Hollywood Walk of Fame.